The following is a list of links to places we think you may find helpful or informative in your search for a donor. If you know of a company or foundation that isn't listed here, please let us know and we may add it on here. 120,000 people are waiting for an organ. 95% of Americans are in favor of being a donor but only 52% are registered. Help bridge the gap by sharing. Living donation offers another choice for transplant candidates, and it saves two lives: the recipient and the next one on the deceased organ waiting list. 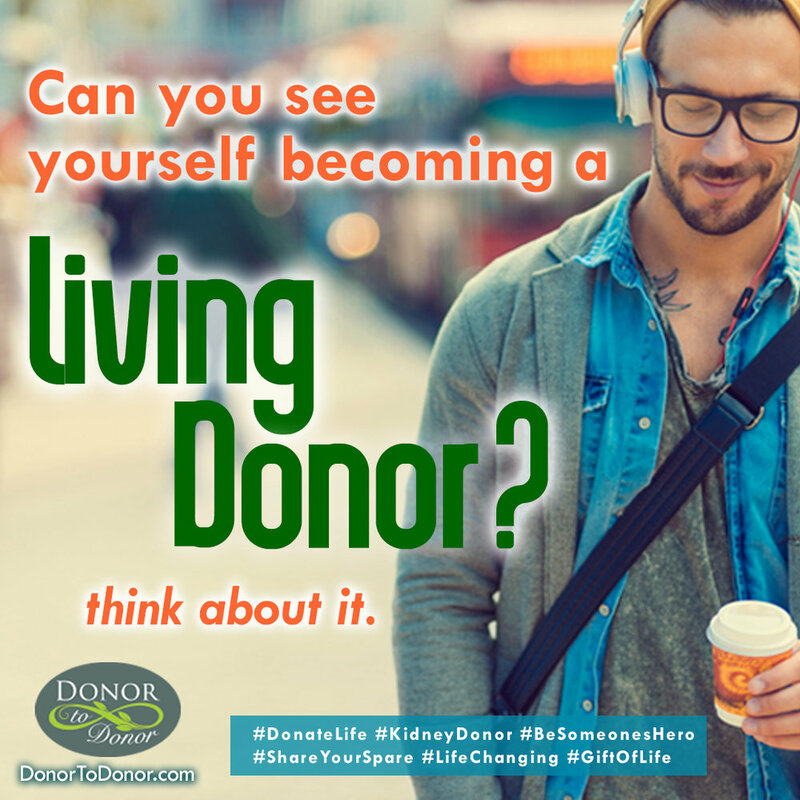 Even better, kidney and liver patients who are able to receive a living donor transplant can receive the best quality organ much sooner, often in less than a year. Half a million people die each year, but only around 5,000 people die in circumstances where their organs can be donated. We have social media programs specifically designed for people in need of Organ Donations. Are you in need of a kidney transplant? Are you on Dialysis or will you be soon? Are you advocating for yourself the best way possible? Do you have a Facebook page to help get the word out more? We can help you create a Facebook page & manage it. There are no guarantees however, we do know the more people that hear your story, the better the chances are of meeting your match. Special Social Media Management & Creative Social Media Solutions. Results will vary from person to person. Are you on Dialysis or at risk of needing Dialysis due to Kidney Failure? Have you been unsuccessful in connecting with a matching Kidney Donor? Are you depressed, frustrated or concerned that long-term Dialysis seems highly likely? After signing up, a personal account manager will contact you to discuss your background. Your responses will then be passed along to the KidneyBuzz.com Social Media Team who will develop your personal and robust bio to share your story and effectively paint you as a 3-Dimensional person on Social Media. The KidneyBuzz.com Social Media Team will then include key terms and key words into your Bio and manage a strategic campaign to help improve your chances of connecting with potential Altruistic Living Kidney Donors. The American Kidney Fund is the nation’s leading non-profit working on behalf of the 31 million Americans with kidney disease. Our mission is to help people fight kidney disease and live healthier lives, and we fulfill that mission by providing a complete spectrum of programs and services: prevention activities, top-rated health educational resources, and direct financial assistance enabling 1 in 5 U.S. kidney patients to access lifesaving medical care, including dialysis and transplantation. We invest in clinical research to improve outcomes for kidney patients, and we fight tirelessly on Capitol Hill for legislation and policies supporting the issues that are important to the people we serve. Published poet, songwriter and photographer thanks to the gift of God my donor family and parents.